May | 2010 | Eugene is huge! Well, at least it's an improvement over "Be the Reds!" In a little over 10 days the 2010 FIFA World Cup will begin. I am eagerly anticipating the World Cup. This is a craze that I have gotten into every four years since…. Hey, wait a minute, Seoul Searcher. You’re an American are you not? Americans don’t like football! Actually football is our most popular sport. Admittedly, soccer is not. This is a Korea blog. 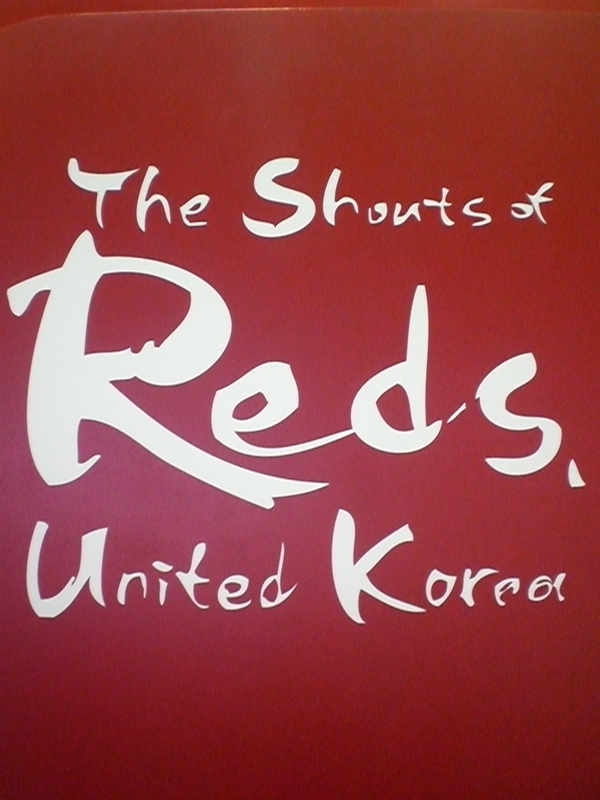 Please talk about Korean football. Ok ok. You’re the one who asked why I liked soccer in the first place. I’ll answer the question. In 1994, the U.S. hosted the FIFA World Cup. I couldn’t have cared less. At the time, I was in high school and I was disillusioned with professional sports altogether. I think in 1994 one of the only games I watched involved the Korean team. My stateside Korean relatives seemed to be really pumped up for it, but the only thing that I noticed was the U.S. announcers mispronouncing the names Hwang (they said H-way-ng)and Seo (they said SEEYO). 1998 in France was altogether forgettable to me. I don’t even remember watching any of the Korean games. The only U.S. game I watched was an embarrassment vs. Iran. So my interest in the world cup officially started in 2002. World IT Show 2010 – VISITED! Women say that there is a 3D HD LED TV display in the picture, but not a single man has found it yet. So yesterday I decided to check out the 2010 World IT Show in the Coex Exhibition Hall. What I saw there will blow you away. There were three different halls, the small business hall (from specific regions) and then the corporate hall. OBVIOUSLY the corporate hall was really flashy and amazing even for the most insignificant of products. However, that doesn’t mean that the small business hall was by any means boring. In fact, there were a few dazzling products there too. Quite possibly the best thing I saw there was several versions of the 3D TV. Some of them needed glasses, others didn’t. In all cases the TV looked like you were looking in, rather the image on the TV coming out at you. One independent company made the hologram TV, which made it look like the image was right in front of you, but you had to be right in front of the TV and at the right angle, otherwise it wouldn’t be at all visible. I think this is a technology they have not yet mastered, but I am sure we will see more of it in the future. What else did you see there? As we speak, I am at the world IT show in the Coex Exhibition Center. There are so many cool things here that I’ll have to post about later, but if you want to check out the website it’s here. By the way, I am writing this entry on a touch screen projection with my bare hands. It’s freaking awesome. Naengmyeon, a cold summer treat! Yum! Naengmyeon is delicious AND beautiful. One of my favorite Korean foods is Naengmyeon (냉면). Naengmyeon is a kind of buckwheat noodle beef soup. It is usually eaten in the summer because it is a great way to beat the heat, as it is served chilled. Wait, it’s COLD? COLD SOUP? Yes. It’s not lukewarm, but chilled. Sometimes it is even served with ice in it to keep it cold as you eat it. Cold soup is certainly not only a Korean thing. The Spanish have a cold soup called Gazpacho. Why would anyone want to eat cold soup? Well, why would anyone want to eat hot dogs? Do you know the materials they are made of and how unhealthy they can be? Um, because they taste good? Yea, well Naengmyeon is enjoyed specifically in summer. Korean summers can be hot! I guarantee you that Naengmyeon sales plummet in winter. Meanwhile Americans put ice in their colas when they go to McDonald’s even in the dead of winter, but that doesn’t seem strange to you, does it? Hmm, I never thought of it that way. Yes, well the soup is served cold, with mixed vegetables. In addition, you can add some gyeocha (겨자, Korean mustard) and vinegar to it according to your taste. There are two main kinds of naengmyeon, mul naengmyeon (물냉면), and bibim naengmyeon(비빔냉면). Bibim naengmyeon is eaten with gochu jang (고추장, Korean red pepper paste) and is spicier and has more ingredients. Where can I eat Naengmyeon? Most Korean restaurants in the U.S. have this as a standard menu item, so I assume that this must be the case in other countries in the world. In Korea there are many naengmyeon restaurants. I’ll tell you about one specifically that I like. What is the Korean word for a broken motorbike? Media Pole in Gangnam Area. 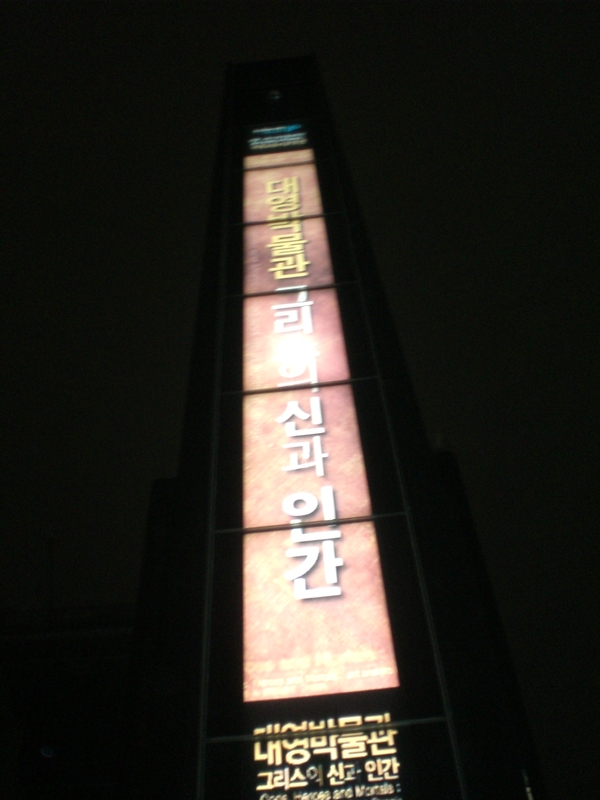 A few posts back I wrote about these signs in the Gangnam area which I thought were LED signs. Well it turns out, I was totally wrong. I guess that’s my fault for taking a picture from the bus instead of getting out to inspect the thing. Well, last night, I was watching the Korea vs Japan soccer match with some friends in Gangnam after work and I got a closer look at one. Can the magic of 2002 happen again? The Korean team is really good this year. Either that, or the Japanese team is really horrible! I can’t believe the ease at which this game was won. I can remember several years ago when a Korea-Japan match was gut wrenching down to the wire. This time.. it was just.. blah. I didn’t really feel any tension after an early goal by Park Jisung (see, if we were going on about Revised Romanization, it would be Bak Ji Seong, but since he himself has chosen Jisung, it’s what we must use). Anyway I think that the Korean team can…. Can you talk about what you were originally talking about? Those signs in Gangnam? Ah, right. Well it turns out, the thing is actually called a media pole. It’s in fact very similar to Digital View, the touch screen map in the subway stations. Anyway the features I saw on the media pole included news, navigation, and photo mail. There’s a camera in the pole, and you can use it to take a picture of yourself and others, then send the picture to your cellular phone. It’s pretty neat, but I don’t think people are going to use it that often. Maybe I’m wrong though, because It’s still kind of cool. In the last post I made, I called the day Buddhamas. Christ’s birthday is Christmas after all. Hmm, well Buddha’s name wasn’t Buddha, it was Siddhartha Gautama. I guess Buddha then was his rank, and his last name was Gautama. So Merry Gautamamas! In Korean, this day is called 부처님 오신 날 (Bucheonim osin nal). It means “The day Buddha came.” This holiday is not uniquely Korean, it is an important day for all Mahayana Buddhists. As such, it is celebrated in China, Japan, Vietnam, India, Thailand, and any other country with a large Buddhist presence, but it is not a national holiday in all of them. In Korea, fortunately, it is a national holiday. Not since Rosh Hashana in elementary school have I been so happy to embrace a holiday from another religion that I don’t belong to. So, you’re not a Buddhist?